Kefalonia is one of those places that can give visitors the full experience of visiting a Greek island. On the one hand, there are plenty of busy resort areas to keep people satisfied. The island is also physically beautiful and it is possible to venture away from the beaten track to enjoy some of this beauty and take in the the traditional Greek life. If you want a beach that has excellent conditions for swimming and is in a picturesque area, Poros Beach is for you! Located about 25 miles away from Argostoli, which is the main town on the island, this beach is easy to access. It is also located at one of the island’s ports so once you arrive on Kefalonia, you can even head to this beach by boat. 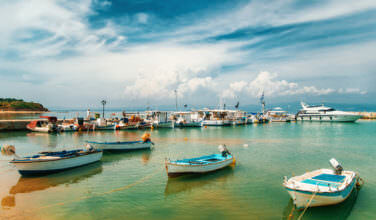 To get to Kefalonia, your best bet is to either take a ferry from one of the major ports in Greece and also take a flight into the regional airport on this island. Once you get to the island, the beach is easily accessed by car or taxi. One of the things that Kefalonia is known for is its physical beauty. It is made up of smooth, fine pebbles that give it an other-worldly quality. Poros Beach is a great example of this because it is located in a stunning area and has great views. However, since Poros is a port, there is plenty to do in the area. There are plenty of resorts, hotels, shops, and restaurants to enjoy during your stay in this part of the island and the beach is one of the highlights of the area. If you know that you want to spend a lot of time at this beach, you should consider staying in one of the nearby resorts. One of the most stunning qualities about this beach is the crystal blue waters. Since the beach area is situated on a small bay, this makes the waters fairly calm. This means that it is an excellent beach for swimming. The water is also very warm so even those who don’t swim much will get some pleasure out of heading into the water for a soak. It is also an organized beach, which means that there are lounges and umbrellas to rent that will also add to your enjoyment. There are also plenty of places nearby to enjoy, such as restaurants and cafes, and you can head to them whenever you need something to eat. While on Kefalonia, you’ll certainly want to spend time at the beach. 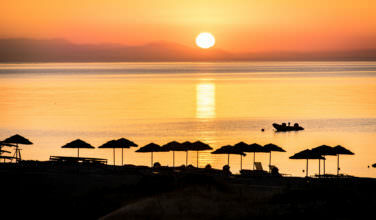 Poros is an excellent choice, especially if you like to swim in warm water and soak up the sun in a relaxed setting.